(Vatican Radio) Pope Francis has met with the commander-in-chief of Myanmar’s Armed Forces during the first day of his Apostolic Visit to the country. The Pope held talks with Senior General Min Aung Hlaing at the Archbishop of Yangon’s residence shortly after his arrival in Myanmar on Monday. Following the courtesy visit, which lasted 15 minutes, the pair exchanged gifts. Pope Francis presented Min Aung Hlaing with a commemorative medal of his visit and in return received a harp in the shape of a boat and an ornate rice bowl. Last year, the United Nations officials called on Myanmar to end military operations that have “led to the systematic violation and abuse of human rights” of minorities in the country’s Rakhine state. The army has denied accusations of wrongdoing by security forces. (Vatican Radio) On the first full day of his journey to Myanmar, Pope Francis travels on Tuesday to the new capital city of Nay Pyi Taw for an official welcome ceremony at the presidential palace. Nay Pyi Taw, where Pope Francis travels on Tuesday to meet the president and popular Burmese leader, Aung San Suu Kyi, is unlike anything I’ve ever seen before. It’s a four hour drive north from Yangon, on the road to Mandalay (literally!) although the pope is taking a short plane trip to the city, which was purpose built by the former military government, just over a decade ago. Its name means ‘Abode of the King’ and it was designed to showcase what the rulers of the day hoped would be the nation’s rapid transformation into a leading Asian economic powerhouse. Almost overnight in 2005, administrative offices were transferred, lock, stock and barrel from Yangon to the new site, which was officially inaugurated with a giant military parade the following year. The part of the city that the pope – and most other visitors - see is an eerie ghost town of wide, empty roads, lined with gleaming government offices, huge luxury hotels and amusement parks that light up like a kind of Disneyland after sundown. On the first day of the Apostolic Journey to Myanmar, November 27, 2017, the papal entourage went to the Shwedagon pagoda, the most prestigious Burmese Buddhist spiritual center. The monumental complex — made up of numerous temples and a central pagoda covered in gold and diamonds, whose history goes back 2,500 years –, is located in Yangon, the country’s ancient capital. It houses relics of the Buddha as well as many precious ornaments and statues. During his visit to Myanmar, the Pope is due to meet with the “Sangha” Supreme Council of Buddhist monks at the Kaba Aye Center. Below is the revised schedule for Pope Francis' visit to Myanmar and Bangladesh. Time listed are local with Eastern Standard Time in parentheses. --10 a.m. (10:30 p.m. Nov. 27) Private meeting at the archbishop's residence with religious leaders. -- 2 p.m. (2:30 a.m.) Departure by plane for Naypyitaw. -- 3:10 p.m. (3:40 a.m.) Arrival at Naypyitaw airport. -- 3:50 p.m. (4:20 a.m.) Welcoming ceremony at the presidential palace. -- 4 p.m. (4:30 a.m.) Courtesy visit to Htin Kyaw, president of the republic, at the presidential palace. -- 4:30 p.m. (5 a.m.) Meeting with Aung San Suu Kyi, state counselor and foreign minister, the country's de facto leader. -- 5:15 p.m. (5:45 a.m.) Meeting with government authorities, members of civil society and the diplomatic corps in the city's international convention center. Speech by pope. -- 6:20 p.m. (6:50 a.m.) Departure by plane for Yangon. -- 7:25 p.m. (7:55 a.m.) Arrival at Yangon airport, transfer to archbishop's residence. 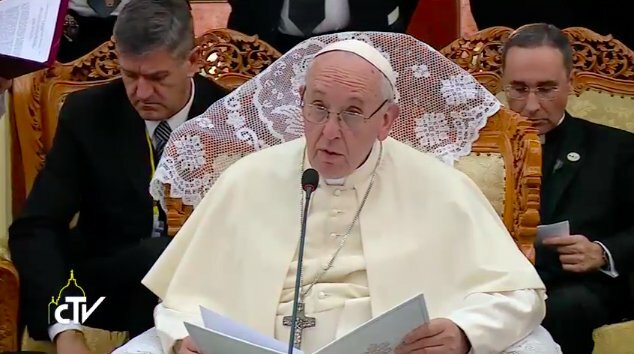 (Vatican Radio) Pope Francis met with 17 leaders of Myanmar’s religious communities Tuesday morning, exhorting them that peace consists in unity in diversity, not in uniformity. The Pope met leaders of Buddhist, Muslim, Hindu, Jewish, Catholic and other Christian communities at the Archbishop’s House in Yangon, at the start of his first full day of his Nov. 27-30 apostolic visit to Myanmar. The Holy See’s spokesman, Greg Burke said that the during his 40-minute meeting with them, the Pope urged them to work together to rebuild the country and that if they argue, they should argue like brothers, who reconcile afterwards. On November 28, 2017, the second day of his Apostolic Journey to Myanmar, Pope Francis met the President of th, Republic Htin Kyaw, as well as the Counsellor of State and Minister of Foreign Affairs Aung San Suu Kyi, Nobel Peace Prize laureate in 1991, at Naypyidaw, the Burmese capital. It was the official welcome ceremony for the Pope, who arrived in the country the day before. In the morning, the Holy Father met with the religious leaders of Myanmar, a country of Buddhist majority, at the Archbishopric of Yangon where he is residing. Then he celebrated Mass, reported a press release of the Holy See Press Office. After lunch, he went by car to Yangon’s International Airport, where he took off at 2:00 pm local time (8:30 am in Rome), onboard flight B737 of the Burmese company MAI. On his arrival at Naypyidaw’s International Airport, about an hour later, the Pontiff was received by a Minister Delegate of the President. Then he went by car to the Presidential Palace, in front of which a ceremony was held at 3:50 pm (10:20 am in Rome) with hymns, military honors and the introduction of delegations. Then the Pope met President Htin Kyaw in private, in the Palace’s “Credentials Hall,” where he also signed the Guest Book: “I invoke upon all the beloved people of Myanmar the divine blessings of justice, peace, and unity,” he wrote in English. During this meeting, the Holy Father gave the Head of State a manuscript of the Apostolic Vatican Library containing the story of Malalankaravatthu, the life of Buddha in seven episodes, in images and in Burmese: the conversion of the city of Rajagaha, the reception of King Bimbisara, the meeting with Sariputta and Assaij, the conversion of Sariputta and Moggallana, the conversion of Suddhodana at Kapilavatthu, the events of Anathapindika and the history of Doctor Jivaka. He came bearing gifts... Reproduction of the Illustrated Life of Buddha. Gift offered by @Pontifex to the President of the Republic of Myanmar. The codex Vat. ind. 49 of the Vatican Apostolic Library narrates the life of the Buddha in seven episodes. (Vatican Radio) Pope Francis began his first full day in Myanmar on Tuesday with an unscheduled encounter at the Archbishop’s House, meeting with a group of 17 leaders from the different religious traditions present in the country. Following that encounter, he travelled by plane up to the capital, Nay Pyi Taw, where he met President Htin Kyaw and Burmese leader, Aung San Suu Kyi, before addressing diplomats and government leaders gathered at an international convention centre. Inside the convention centre sat a colourful mix of military men in green uniforms, cardinals and bishops, diplomats and politicians in traditional coloured sarongs and flip flops. A row of children in ethnic costumes flanked the pope and ‘The Lady’ as they took their place on stage. Unsurprisingly, in a country still struggling to emerge from half a century of military dictatorship, the pope’s words were firmly focused on dialogue, reconciliation and respect for human rights. (Vatican Radio) Pope Francis on Tuesday is spending his first full day in Myanmar where he traveled to the country's capital to meet with the country’s de facto civilian leader, Nobel laureate Aung San Suu Kyi. After meeting with her privately, she pronnounced an official welcome speech at the Myanmar International Convention Center where the Pope met with authorities, representatives of civil society and the diplomatic corps. In her address to the Pope, Suu Kyi quoted from the Sermon on the Mount saying it presents a challenge for political and religious leaders and she mentioned that “of the many challenges that our government has been facing, the situation in the Rakhine has most strongly captured the attention of the world”. She also said that the aim of the Myanmar Government is ”to bring out the beauty of our diversity and to make it our strength, by protecting rights, fostering tolerance, ensuring security for all”. (Vatican Radio) Pope Francis meets on Wednesday afternoon with Myanmar’s Supreme Council of Buddhist monks, as well as with the country’s Minister for Religious Affairs. There are about half a million monks in the country today, plus over 60.000 Buddhist nuns, often seen with shaved heads and pink robes, collecting money or uncooked rice in metal alms bowls. Philippa Hitchen is in Yangon to cover this papal visit and has been finding out more about the female face of Buddhism in the country today…. Even the briefest visit to any city, town or village in Myanmar leaves you in no doubt that this is an overwhelmingly Buddhist nation. Golden gates and pointed domes, rise up out of the landscape and monks, in their simple maroon or brown robes, are everywhere to be seen. According to the statistics, almost 90 percent of people belong to this faith, with monks, collectively known as the Sangha, revered as highly respected members of society. Outwardly, it’s a deeply religious country, yet according to Ketu Mala, a well-known Burmese nun I met, there’s an urgent need for reform within this very traditional, patriarchal society. -- 8:30 a.m. (9 p.m. Nov. 28) Mass at Kyaikkasan sports ground. Homily by pope. -- 4:15 p.m. (4:45 a.m.) Meeting with the Sangha supreme council of Buddhist monks at the Kaba Aye pagoda. Speech by pope. -- 5:15 p.m. (5:45 a.m.) Meeting with the bishops of Myanmar at St. Mary's Cathedral. Speech by pope. (Vatican Radio) Pope Francis on Wednesday morning celebrated Mass at a sports ground in central Yangon, on the third day of his pastoral visit to Myanmar. As our correspondent in Yangon, Philippa Hitchen reports, the event marked a highlight of his journey for the small Catholic Church in the country…. This was the moment the Catholic community in Myanmar had been patiently waiting for, since the pope’s arrival in the country two days ago. As he acknowledged in his homily, many of the faithful had come to Yangon from remote, rural villages or mountainous communities and had journeyed for several days on foot, by train, bus or the uncomfortable, open-sided trucks that are the most common form of transport here. They’d been camping out close to the sports ground since Monday, in anticipation of this historic, first papal Mass on Burmese soil. The Kyaikkasan ground itself, built under British rule as Rangoon’s racecourse, is closely connected to the turbulent past century of the country’s history. During the years of military dictatorship, following the 1962 coup, it was used as a temporary detention centre. Following the death of Burma’s most famous diplomat, former U.N. Secretary General, U Thant, his coffin was briefly displayed here, before being seized by students protesting against the military’s refusal to honour their globally respected political leader. Pope Francis in his homily alluded to this turbulent history, noting how “many in Myanmar bear the wounds of violence” and are searching for ways to heal “every hurt and every painful memory”. While we often try to do this through anger and revenge, he said, it is only through forgiveness and mercy that we can truly find healing in our hearts. He described this loving mercy, modelled by Jesus on the Cross, as kind of “a spiritual GPS” that unfailingly guides us, even when we seem to have lost our way. This is mount Taber Experience. The simple Catholics have the stirring experience. We are today transported to a mountain of bliss. Life will be never same to Catholics in Myanmar. Just a year ago, the thought that this little flock will be breaking bread with our Holy Fr Francis would have been a just dream. We are a small flock. We are like Zacchaeus. Amidst nations, we could not see our shepherd. Like Zacchaeus, we were called, come down, I want to come to your house. That is our Holy Father. Holy Father Francis: A good Shepherd goes after the small and those in the margin. You have broken the word and broken the bread. Like the moving words of our Mother, we reecho again and again, “He has raised the lowly!” Our soul glorifies. Like the disciples at Mount Taber, we will go back. We go back with extraordinary spiritual energy, proud to be Catholics, challenged to live the Gospel. (Vatican Radio) Pope Francis had an action-packed afternoon in Myanmar on Wednesday, meeting with the nation’s Buddhist leaders at a peace Pagoda and with the country’s Catholic bishops at the Archbishop’s residence where he’s staying. He also managed to squeeze in an unscheduled encounter with the local Jesuit community there, as he likes to do on every foreign journey. Philippa Hitchen is in Yangon and reports that the focus of the day’s events was on the role of all religions in shaping society through the shared values of justice, dignity and peace. The Pope left the Archbishopric of Yangon, where he is residing, and went by car to the Kaba Aye Center, one of the most venerated Buddhist temples of South East Asia. The Minister for Religious Affairs and Culture, Thura U Aung Ko received him on his arrival at the Center. The Holy Father took off his shoes before entering the temple. The meeting with the “Sangha” Supreme Council took place at 4:15 pm (19:45 Rome time), in a large hall of the complex. The monks of the State Committee of the Sangha Maha Nayaka represent the highest authority of the Buddhist clergy of the country, which is 88% Buddhist, <and was> created, designed and <is> entirely controlled by the Authorities, explained Eglises d’Asie, agency of the Foreign Missions of Paris. Founded in 1980 by the Military Junta then in power, the Central Committee is made up of 47 members representing the nine branches of Burmese Buddhism. The Holy Father asked Myanmar’s Bishops to make a “special effort to accompany young people.” “Take care of their formation in healthy moral principles, which will guide them in addressing the challenges of a rapidly changing world,” requested Francis. The Pope met in the afternoon (12:15 Rome time) with 22 Bishops of Myanmar in the Archbishopric of Yangon. Monsignor Felix Lian Khen Thang, President of the country’s Episcopal Conference, greeted the Pope on his arrival. At the end of the meeting, all the Bishops greeted the Pontiff personally and had a group photo taken. Then the Holy Father blessed the first stone of 16 churches, the major Seminary, and the Apostolic Nunciature. Finally, after a group photo with 300 seminarians, Pope Francis returned to the Archbishopric, where he met with 30 members of the missionaries of the Society of Jesus in Myanmar in the ground floor Chapel. Page created in 2.188 seconds with 19 queries.